2001 seems to be an interesting year for The Spirit collectibles, so far there has been an action figure and a statue, and now there is a lunchbox! 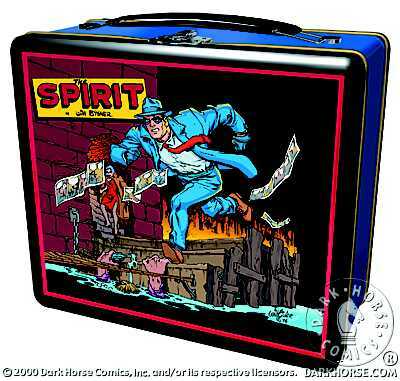 Dark Horse have released several other comic related lunchboxes over the past couple of years so it should come as no surprise that there is now a Spirit lunchbox! 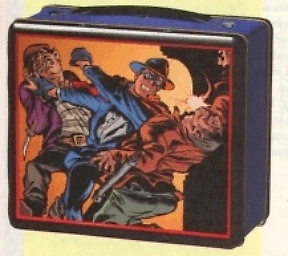 Like the other lunchboxes in the series, this measures 8" x 7" x 3 3/4" and has embossed metal on the front and back. Featuring artwork by Will Eisner on both the front and back (as shown above), it also comes with a collector's card. The lunchbox can be ordered from Bud Plant by clicking here. A look at Master Man, the Golden Age comic book character who appeared in a handful of issues of Master Comics, and who bore a striking resemblence to Fawcett's Captain Marvel can be found here.